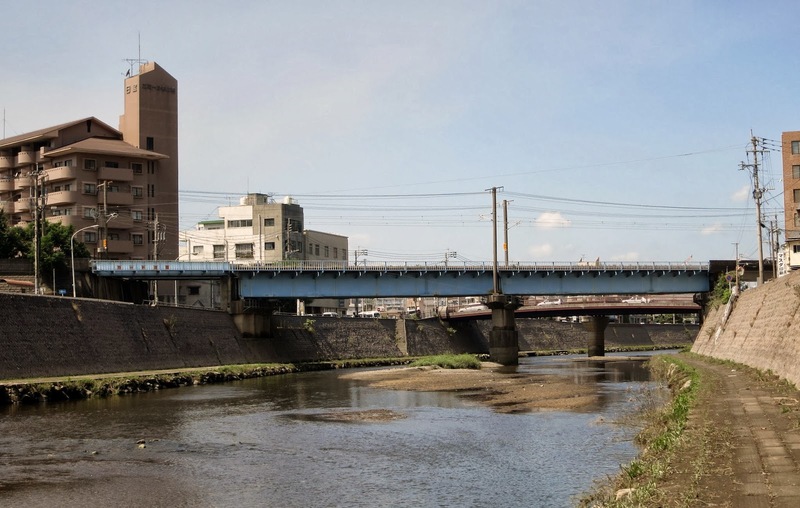 The next bridge carries railroad tracks across the Kotsuki River. The bridge has two deep steel girder spans across the river as well as through girder approach spans. The piers along the levees have backwalls to handle the transition from through girder to deck girder spans. The river pier is supported on a very large caisson projecting ten feet above the river bottom. The bridge carries electric lines to power the trains. This bridge doesn't look like it was built to carry high speed trains (even though bullet trains would be traveling slowly close to the station). It's just north of Kagoshimachuo Station but I noticed on the map that there is another set of tracks perpendicular to these tracks going into the station. 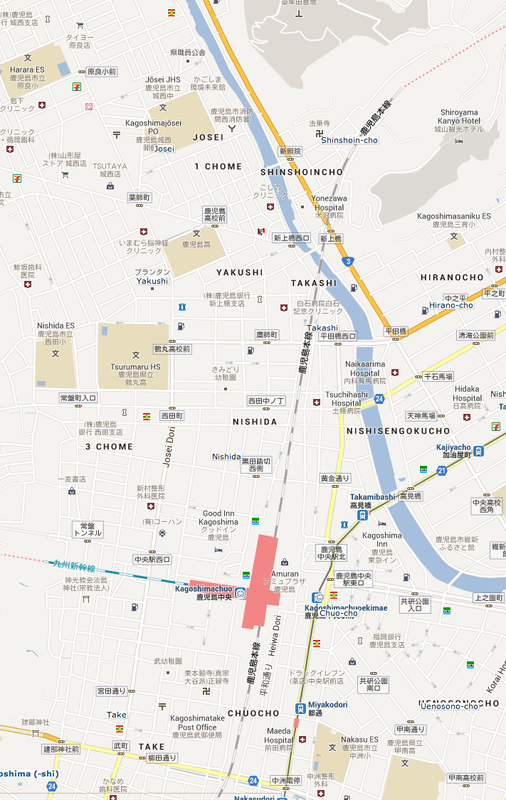 Since Kagoshimachuo Station is the final stop for the Shinkansen it makes sense that the tracks would end at the station (see map below). Note that both railroad lines go into tunnels (red dots) soon after leaving the station. On our trip from Tokyo to Kagoshima we spend a lot of time underground after leaving Honshu for Kyushu. Kagoshima Prefecture, Japan's Bridges: Railroad Bridge across the Kotsuki River by Mark Yashinsky is licensed under a Creative Commons Attribution-NonCommercial-NoDerivs 3.0 Unported License.